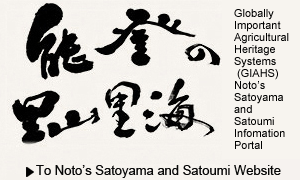 In June 2011, "Noto's Satoyama and Satoumi," which expands across four cities and five towns of the Noto Peninsula, was designated as a GIAHS (Globally Important Agricultural Heritage System) by the Food and Agriculture Organization of the United Nations (FAO). The designation was the result of the high merit of the area; it promotes biological diversity and maintains the ecosystem and landscape through environment-friendly traditional agriculture, forestry and fishery. This site presents numerous aspects of Noto’s Satoyama and Satoumi, of which Ishikawa Prefecture is very proud. These are divided into five categories: “Nature and Landscapes”, “History and Historical Sites”, “Agriculture, Forestry and Fishery Industries and Food”, “Festivals and Customs”, and “Life and Traditional Techniques”. Each characteristic has been created through people’s lives and religious devotion over the years, and is a part of Noto’s unique makeup, represented by the phrase, “Even the soil of Noto is kind”. Noto is blessed with abundant nature, and a wide variety of animals and plants live on the peninsula. The region also has many landscapes of Satoyama (mountain areas), and Satoumi (ocean areas), where people have lived and worked in coexistence with the nature. The origin of Noto dates back to the Nara period of the 8th century. There are many historical sites that inform us about Noto’s long history and distinctive cultural climate, as well as the lifestyle of our ancestors. Surrounded by mountains and the sea, the Noto area has been a place of agriculture, forestry and fishery. The nutritious, tasty products from the nearby mountains and sea, as well as the local cuisine, which has been handed down through the generations, are a source of joy for the inhabitants of the region. Noto is said to be a treasury of festivals. There are many traditional festivals that involve praying for a bumper harvest and a good catch of fish, as well as giving thanks to nature and one’s ancestors. Spectators are dumbstruck by the energetic festival scenes, which are unusual even in Japan. The people of Noto have enjoyed the abundant seasonal blessings of nature, while also having to contend with its harshness. In so doing, they have developed the wisdom and know-how that make Noto a unique region.